The literal heart of Chicago, the Loop is at the center of the action downtown. It’s always busy, always moving fast, and always filled with the commerce, culture, and entertainment that makes the city distinct. When you live in the Loop, you’ll be next door to some of the biggest businesses in the city (in every sense), and you’ll only have to walk out your front door to find a world class restaurant, bar, show or park–or get on the train that will take you where you need to go. As your go-to Loop movers, we’ll help you navigate the bustle and get your stuff settled, so you can immerse yourself in this fast-paced neighborhood you now call home. 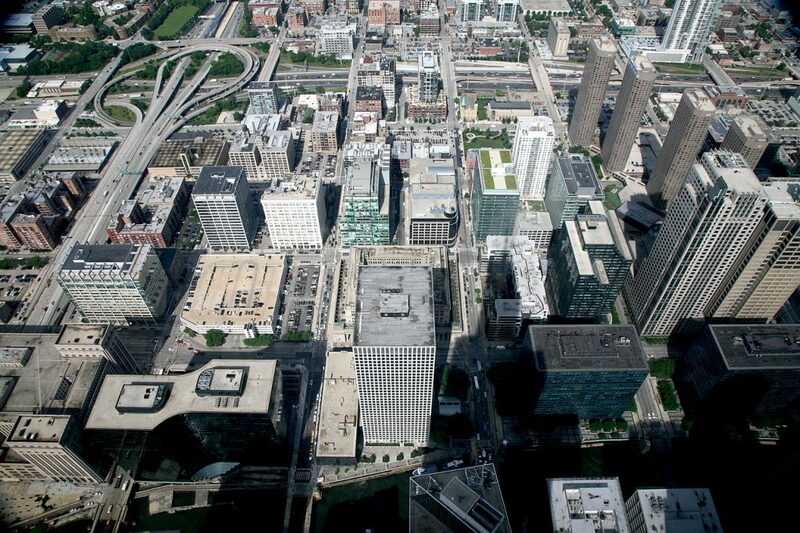 A little more than 20,000 people live in The Loop, with an equal split of women and men. Loop residents have a median age in their mid-30s, and a median annual income of over $100k. Many people in the area live as singles or with roommates, but a sizable percentage of residents are families with children. The Loop has been a hub for Chicago transportation since the city began growing in the early 19th century. It was originally surrounded by railroad stations, at a time when these were key to successful commerce, and the area became populous and diverse as the century went on. The Loop was devastated by the Chicago Fire of 1871, but rebuilt as a district of skyscrapers and cutting edge urban planning in the decades that followed. Its commercial and business hubs expanded in the 20th century, leaving the The Loop the center of action that it is today. Now you’ve got the gist, here are some highlights—and basics—we found to help you start your best Loop life. Millennium Park: Huge green spaces, amphitheater, free events, and much more. Crown Fountain: Interactive water feature for all. Chicago Art Institute: World-class exhibits. Chicago Cultural Center: Free exhibits and events. Harold Washington Library: Chicago’s flagship public library. Community events for all ages. Theater District: The latest big shows. Willis Tower: Second tallest building in the US. Pizza Delivery: Lou Malnati’s. A Chicago staple. Italian: Trattoria no. 10. Great pre-show option. German: The Berghff. Almost unchanged since 1898. French: Everest. Classy prix fixe at the top of the Chicago Stock Exchange. American: The Dearborn. Brand new twists on Midwestern classics. Global: The Marq. Highly-rated seasonal menu. Patio: The Gage. Modern comfort food with views of Millennium Park. Steakhouse: Remington’s. Classic menu, modern decor. Wine: Townhouse Wine Bar. Creative food pairings. Cocktails: Cindy’s Rooftop. Central Chicago views. Beer: Miller’s Tavern. Classic pub grub. Irish: Emerald Loop Bar & Grill. Comfortable space with filling food. Hangout: 2Twenty2 Tavern. Upscale bar games and lounge space. Dive: Sky-Ride Cocktail Lounge. Neighborhood haunt in the midst of the city. Partying: Brando’s Speakeasy. Dancing and karaoke. North Loop Market: A quick place to stop. Goddess and the Baker: Full meals and indulgent desserts. Caffe RoM: Classic Italian style. Sandwiches and gelato. Lake Shore East Dog Park Features K9 grass. LA Fitness: Equipment, classes, gyms and pool. FFC Union Station: Equipment, classes and pool. Several. See website for locations and hours. This has been a tiny sampling of the great things you’ll experience at your new Loop home. As a seasoned Loop moving company, we’ve learned all about the staples and cool places in the area. We’re happy to share more! As you’re planning your big move, cross one major thing off your to-do list, and book Loop movers who’ll a take load of stress off your mind. Call us at New City Moving, and we’ll help you move safely, smoothly, and on-schedule, so you can settle right in and start living your greatest Loop life.